Each year as Seattle begins its tumultuous tumble into Summer (and weathermen, I assume, consult their Magic 8 Balls for the forecast), a small group of winemakers restring their guitars, turn their amps to 11, and head to Seattle to rock your socks off. 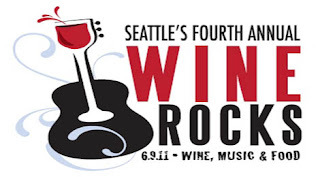 June 9 marks the 4th annual return of Wine Rocks Seattle and its move to the Georgetown Ballroom to accommodate all who wish to pair their Bordeaux Blend with a driving bass line. While music is a staple of tastings and wine events throughout the year, rarely do you have the opportunity to hear a guitar solo from the person who crafted the wine you’re enjoying. Contrary to popular belief, winemakers do more than just make wine (who knew!? ), and for many music is their other passion area. For Jamie Brown of Waters Winery, (@waterswinery) the combination makes perfect sense. The predictive skills he developed making music in the Seattle rock scene have translated to a flexible and anticipatory approach to winemaking. Jamie was initially lured to Wine Rocks with whispers of big-name rockstars and Gibson guitars. The opportunity to share wine in a new way has kept him coming back, and remaining a fan favorite. Jamie was lured to wine while living out that common artist's tale, working in restaurants by day to support his rock dreams. As he became exposed to more wine, he learned the lesson of many a young wine aficionado - sometimes you need to make a real effort to find the good stuff in your price range. As his hometown of Walla Walla came up in wine whispers more and more, Jamie decided he could do something different with it, and headed east. Jamie's philosophy in life plays out in how he approaches his music and his wine: you don't have to sell out to have success and have fun. Fitting, then, that Jamie selected the late Jeff Buckley as the musician he'd most like to have try his wine. For Chip McLaughlin, it’s as though the event was created with him in mind. With his new label, Vinyl Wines, (@vinylwines) Chip has carefully melded his two great loves, independent music and stellar wine. Not all of us are so lucky to have our career course charted at an early age, but with a father in radio and a brother in the wine industry, Chip knew by age 11 that music and wine were in his future. When he received Cab Franc grapes for his birthday from a family friend, there was no looking back. The influence of music on his winemaking is infused throughout the label. Each bottle of Vinyl Wines has a code on the cork. Once you’ve popped the bottle, the code unlocks a 10 song playlist of local and national unsigned musicians, including tunes from Chip himself. While Chip’s own music stylings are alternative, coupling crunchy guitars and melodic piano, the musician he’d most like to have check out Vinyl Wines is Tool’s Maynard Keenan. Adding to my Toolbelt of Trivial Knowledge, I was informed that Maynard is in fact quite the wine afficianado, contributing to Wine Spectator and owning two Arizona vineyards. Chip would like to show him a thing or two about how we do things in Washington wine country. The appeal of Wine Rocks for these musician/winemakers is obvious, but even better is that Wine Rocks is a benefit, with this year’s proceeds going to non-profit art collective ajusticenetwork. Making philanthropy as simple as tasting Washington wines and enjoying great music is just one of the reasons Wine Rocks keeps folks coming back. So, what do the winemakers hope you’ll get out of the evening? Just have fun with it! The music focus makes this a great event for those just starting to learn about wine, and the winemakers appreciate a new vibe to the tasting experience. With 30 wineries and breweries, great food and winemakers unleashed at the mic, it’s a great way to support a good cause and enjoy Washington wine in a new way…with more reverb. Tickets are available now – hope to see you there!